It is my husband’s birthday. He is a great baker and loves cake. I love cake, but am not a great baker. It is mostly a good thing that we are able to do different things, apart from when it comes to birthdays. I refuse to buy him a cake and every year insist on torturing myself by attempting to make the cake myself. This becomes extra problematic, because we are (like millions of others) massive Great British Bake Off fans and a few weeks ago, after watching the contestants make a charlotte russe , he declared that this was the cake he wanted for his birthday… For God’s sake, it has multiple layers, requires patience and skill and the ingredients list contains things which are most definitely not cupboard staples. It is safe to say I panicked. Two days ago he came home and said he didn’t want me to get too stressed about the cake and any old thing would do. Firstly, I was outraged, I mean, does he not think I am capable of making such a technical masterpiece? I huffed and puffed and reminded him of the super duper chocolate cake I made him 3 years ago which, by the way, he didn’t even eat, because he had had a crap day at work and just wanted to go to bed when he got home. I know what you are thinking, this was not an excuse, no, it was actually a pretty good cake. Flour-less, lots of eggs and chocolate (and only a couple of burnt bits). 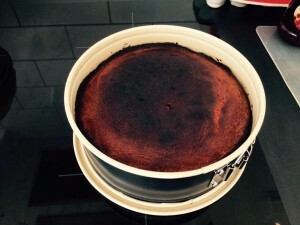 Or maybe he was tainted by previous attempts by me to make cake, anyway… I was also relieved, I mean, let’s not kid ourselves, there are things I can do, but bake complex stuff is not one of them. So, I rang my sister and she talked me through how to make a sponge cake. I did not know what to do next, so I tweeted #GBBO winner Nadiya (poor woman has probably now got hundreds of people like me tweeting her every day), put the cake in the fridge and went to do the school run. My son inspected the cake when he got home, don’t worry, says he, you can just cut off the burnt bits and cover them with icing, Dad will never know! I am past outrage now, and decided to follow his advice, only when I tried to ice it, all the burnt bits got stuck to the icing and produced a sort of gritty texture. Nice. I cannot ice it again as I have run out of icing sugar, and I’m not sure it’ll do much good anyway. So, I have covered it with raspberries to make sure all the offending parts are invisible. Hope Ed has a Happy Birthday.The cake looks good from the picture.Made with love.That is what counts..! It tasted great, plus as anyone knows burnt crunchy bits are one of your 5 a day. 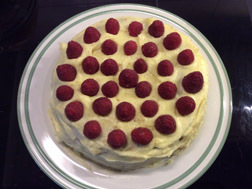 Well, I already know that Ed with help of the boys bakes a mean cake, and now ed has commended Gretel….A good time to renew my passport perhaps! I promise not to make you a cake when you come and visit! I’ve had so many cake disasters it’s hard to count….suffice to say I have to head to tesco when school ask for contributions for the cake stall….